September 2012 - That's My Family! While I’m only working part time right now, I’ll be pregnant again soon and that’s another part time job in itself. Packing lunches was NOT something I was ever looking forward too. Until Keli “stepped” into my life. She brought me into the wonderful world of Bento boxes and showed me that it doesn’t take a lot of time or a lot of effort. Which Is good since I have neither of those. I soared through my first week ease, and had so much fun. Maybe the holiday week made it a little easier. 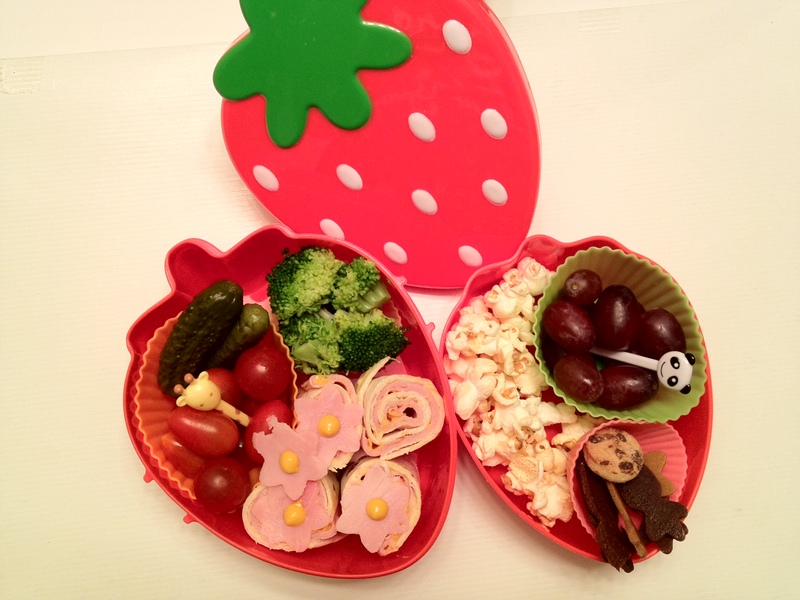 Ham rolls ups, baby dill pickles, mini ritz crackers, steamed (cold) broccoli, strawberries and 2 cookies. I didn’t know how much food he’d eat but I figured I’d rather over pack my first box, than under pack it. there were FIVE crackers left! I was shocked and very happy. 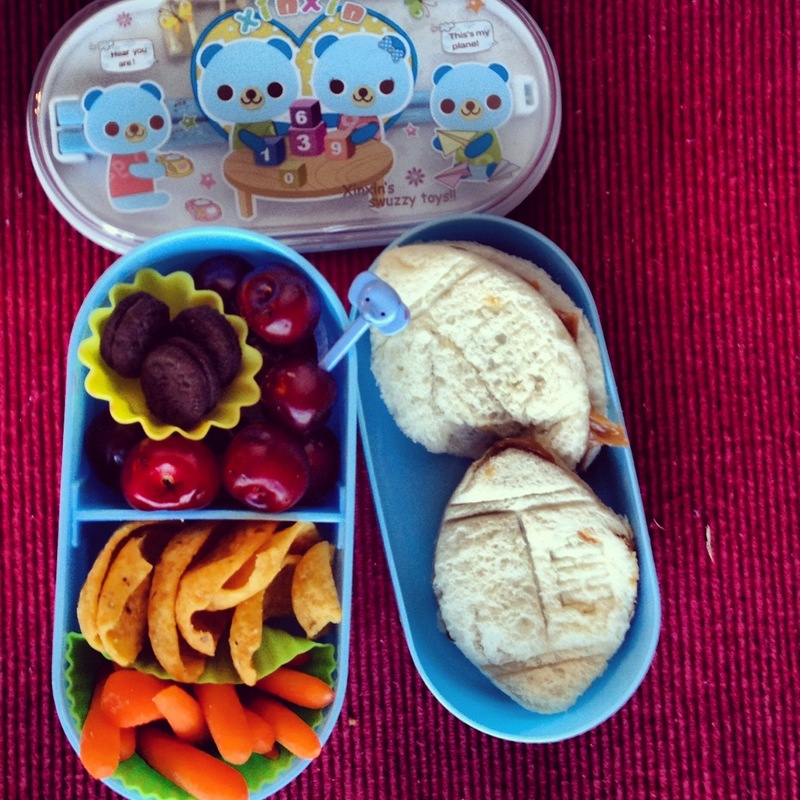 Sunbutter Football sandwiches, fritos, baby carrots, pitted cherries and mini oreos. I had a MUCH better idea for today’s lunch but he snuck out of his room and “caught me” making it. He called all the shots from that point. So EVERYTHING was his idea. Even the box with the chopsticks. When I picked him up from lunch he scolded me for not packin”g meaties” so he could use his chopsticks. I know better for next time. 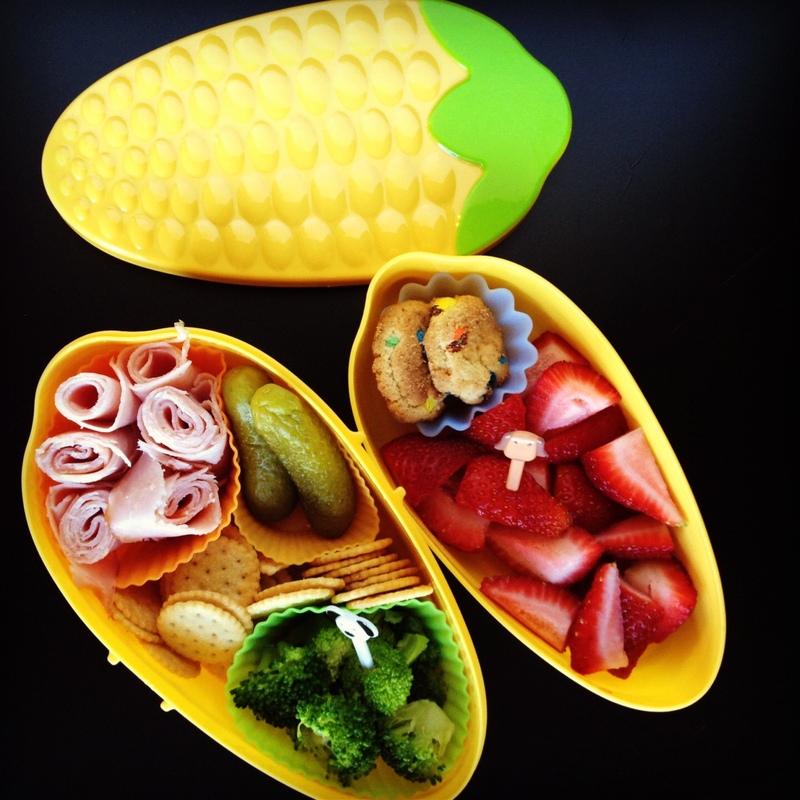 Tortilla, ham and mustard “sushi,” (with little ham flowers on top), Garden grape tomatoes, baby dill pickles, steamed broccoli, popcorn, grapes, fruit leather cut into carrots (because he thought that was funny) and 1 little tiny cookie. 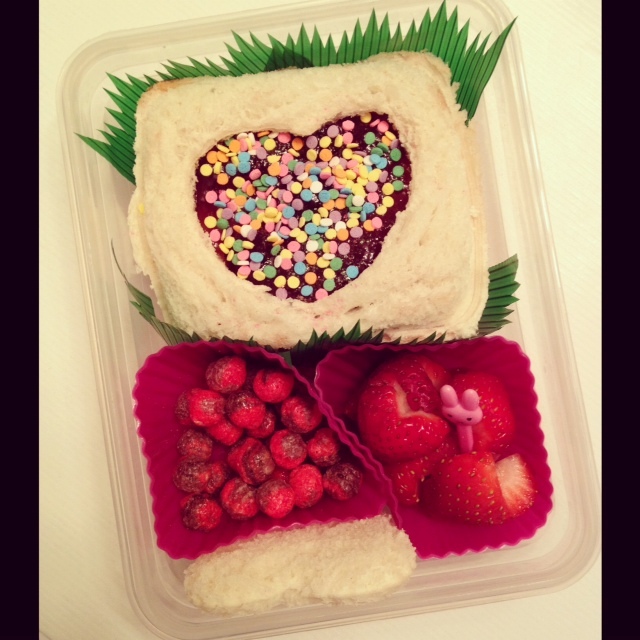 Sunbutter and Strawberry Jam sandwich (with sprinkles), Pretzels under the sandwich, strawberry hearts and red cereal. This lunch is VERY sugar heavy and NOT typical. But he’s snack today was all veggies, and my mom is spending the afternoon with him so I don’t have to deal with the sugar rush. Usually he has an early day on Friday and only needs a snack. So I plan on making Friday’s “Scrap Snack Fridays.” Because there are typically scraps left when I make his food in fun shapes. But the dogs were really into my new lunch making routine and happily gobbled them all up. And this week he has a normal full day so we scrolled through some lunch ideas together and he chose this one by himself. This week was so much fun and he ate almost everything! He told me everyday how fun his lunch was and THAT is why I did this. I can’t wait till next week.